I love coaching. Often at the end of a session, a client will give a big sigh and say, “I feel better.” I usually end a session by asking, “What worked well for you today?” “What didn’t work as well.” Often, being able to talk about anything without judgment or interruption is the biggest gift we give our clients. Coaching is different from counseling, mentoring or consulting. Counseling focuses on helping clients figure out what has brought them to this place in time and how to keep their circumstances from holding them back. Mentors help individuals develop in certain areas by sharing their experiences and insights. Consultants often have a certain expertise that they share with clients. Coaches accept people as they are at this moment in time, create a psychologically safe space so they can visualize where they want to be, what they want to do, and most importantly, Who they want to be. Coaches ask provocative questions, notice words and body language that clients may not be aware of, and hold them accountable for what they said they want to accomplish. 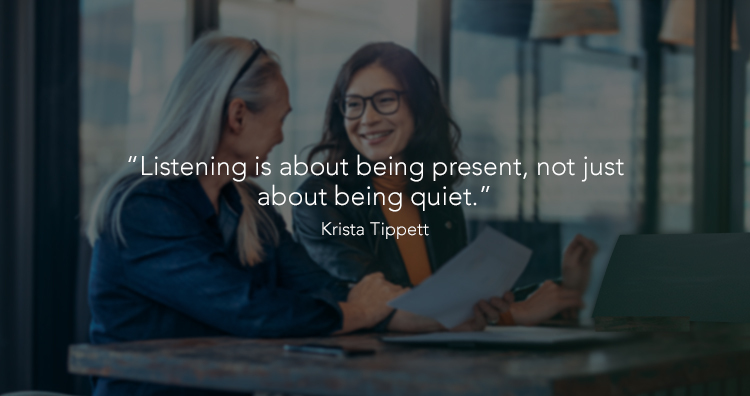 There are many different methodologies that coaches may use, but all good coaches listen deeply and nonjudgmentally, create safe spaces, and respect their clients completely. Research has shown that the success of a coaching engagement is not due to the methodology or tools employed but to the relationship and trust between the coach and the client.